Recognizing every child’s right to a family; FSC tries to ensure that every child has an opportunity to stay with his/her birth family. FSC has been a pioneer of the foster care programme for children awaiting adoption i.e. placing relinquished children in foster care instead of keeping them in residential children homes. FSC has been instrumental in formulating guidelines for foster care which have been approved by the Government of India. FSC has pioneered in promoting the ‘non institutional approach’ in the field of Child protection. Non-institutional programmes like Adoption, Foster Care, Sponsorship and Community Outreach form a part of FSC’s core line of activity. FSC conducts study classes for young children, organizes awareness drives for adolescent girls and vocational training for girls and boys to instill employability skills. Family based and community oriented programmes are also conducted regularly to support families in difficult situations. FSC works closely with low income families residing in Colaba, Cuffe Parade and Bhayander. Total Income: FSC’s total income increased Y-o-Y by 22% in FY13 i.e. Rs8.2mn in FY13 v/s Rs6.7mn in FY12. The major revenue contributors in FY13 were individual sources, followed by interest income. 66% of total income i.e. Rs5.4mn in FY13 was raised from donations which could be from individuals and corporate sources. 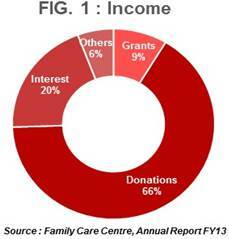 Donations have remained the major revenue contributor to FSC’s total income since FY10. ­The income from this source has posted a 4-Year CAGR of 41% for the period FY10-FY13. The increasing support from donors is owing to FSC’s continuous effort to retain its donor base by constantly involving donors in their ward’s performance. Investments & Interest Income: FSC’s investments have been around Rs13mn since the past two financial years. These are largely in the form of fixed deposits with HDFC Bank. FSC also owns a few units of Unit Trust of India; fetching them some dividend income on these units each year. On an investment base of Rs13mn, the interest income generated in FY13 was Rs1.6mn i.e. 20% of total income for the same period. The interest income has grown at a 4-Year CAGR of 12%; whereas investments grew at 9% for the period FY10-FY13. 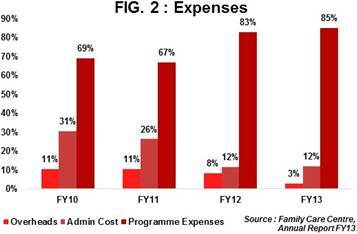 Total Programme Expenses: In FY13, 95% of total expenses was incurred towards execution of the programmes; i.e. Rs5.4mn was used for beneficiaries. Out of this, 28% i.e. Rs1.3mn was used to pay salaries/stipend to employees and volunteers directly involved in executing the projects. Other NGOs listed with HelpYourNGO in the development space incurred an average of 90% of total expenses towards programmes. The declining trend in overhead expenses since FY10 is noteworthy. This is evident from FSC’s overhead cost of only 3% in FY13, this has been an all-time low for FSC. General Funds: General funds were to the tune of Rs15.2mn; up by 20% in FY13 from the previous year. The Y-o-Y increase can be attributed to rising income and surplus generated on account of improving spending pattern over past 4 years since FY10. Income Growth Rate: The number of individual supporters for FSC’s programmes is increasing every year and this has been reflected each year by an increase in total income. FSC posted a 4-Year income CAGR of 22% from FY10 to FY13. The amount raised annually is utilized solely on the existing beneficiaries. As an organizational strategy, FSC works with a limited number of families in selected low income communities for period of 3-5 years until they are able to make an impact in the lives of these families. Self Sufficiency Ratio: FSC maintains healthy self-sufficiency ratio of 126% in FY13. This has also been improving each year (Self-sufficiency ratio measures how much of expenses can be met from own income – individual donations/corpus income/fee income). Retaining good quality women employees and tackling the persistent issue arising due to high attrition rate. Cumbrous documentation requirement from state/local government bodies on a regular basis; increasing admin load on limited senior resources. The Managing Committee is governed 4 ex-officio members, 6 elected and 5 nominated members; having rich experience in various fields. Board Meetings are held bi-monthly to review the operations and discuss new proposals, if any. The organization is accredited with Credibility Alliance and satisfies their norms for good governance and transparency.